It's Halloween night in Alton, New Hampshire, a quaint town on the shores of Lake Winnipesaukee of just over 5,000 people located smack dab in the middle of one of America's quintessential swing congressional districts, and Republican candidate Eddie Edwards is handing out candy to a young girl proudly displaying her light-up princess dress. "Happy Halloween, don't forget to vote!" Edwards says with a nod to the young girl's parents. A child dressed as a "Pac-Man" machine, a tall man sporting scarily realistic costume of "Halloween" villain Michael Myers, and a young boy donning a policeman's cap all drop by as the candidate diligently drops handfuls of candy into their waiting arms. It's New Hampshire, less than a week from a pivotal midterm election, and Edwards, an African-American Navy veteran and former police officer, and his Democratic opponent Chris Pappas, an openly gay member of the New Hampshire Executive Council, are both vying for every last vote in a race that puts the state's political independence and idiosyncrasies on full display. 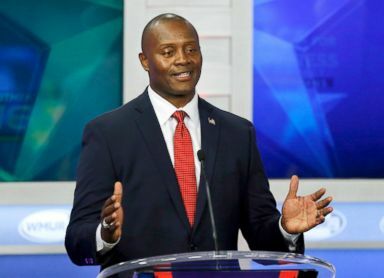 No matter who emerges victorious in the race this Tuesday, history will be made by either Edwards or Pappas, who would be the state's first African-American or openly gay Member of Congress respectively. As the crowd of trick or treaters passing by the candidate started to thin, a woman approaches Edwards and leans in close to whisper that she is supporting him, despite the fact that her family members are all Democrats. Edwards gives her a thumbs up and a hearty thank you. New Hampshire's 1st Congressional District, which includes the cities like Manchester and Portsmouth and more rural areas alongside the state's border with Maine, has switched back and forth between Democratic and Republican control for each of the past five election cycles, and the retirement of incumbent Democratic Congresswoman Carol Shea-Porter immediately put the seat back on the list of battleground races that will play into control of the U.S. House on Tuesday. "We’re going to stop that," Edwards, who has been joined on the campaign trail by the likes of former New Jersey Gov. Chris Christie and President Trump's personal attorney Rudy Giuliani, told ABC News of the district's inconsistency in party representation. He chalked that flux up to voters' desire to have responsive representation in Washington. Republican hopeful for New Hampshire's 1st Congressional District Eddie Edwards speaks during a debate at St. Anselm College in Manchester, N.H., Sept. 6, 2018. "That’s New Hampshire. They’re all about Live Free or Die. We want to make sure we have representation that reflects our values and who we are in this state," Edwards told ABC News in an interview at a makeshift campaign office in Alton inside a house owned by a local state representative and fire chief, "You've got to bring it every election, you’ve got to deliver it when you’re there. And if you’re not, and you don’t deliver, voters will let you know." The potential historic nature of the race is not lost on Edwards. "That’s what America is all about right? New Hampshire proves every single stereotype and statistic about our country wrong every single time," Edwards said, "You’re in a state that is 93 percent white, and they’re electing potentially their first African-American running against an openly gay person in our state – that’s what New Hampshire is all about. In New Hampshire, it doesn’t matter your race, your ethnicity, the gender...what you give to your family to your community and your country is what makes you special." The district voted for George W. Bush twice, Barack Obama twice, and narrowly sided with Donald Trump in 2016, but Edwards says support for the President is understated by widespread in the district. "People are happy, and people are quiet too. There’s a lot of support for the President in this district. The problem is that Republicans are afraid to be attacked right now," Edwards said, "I met one of our seniors in our state, she whispered to me, she said I’m going to vote for you, I really support our president, I really support Republicans, but I can’t say it too loudly because I get bullied. So I think it’s underplayed just how much support the President has in this district." But following a week defined by political violence and a President who shows little desire to ratchet down the tension, the depressing effect Trump could have on candidates like Edwards still looms, despite the candidates dismissals. "We’re a nation of 330 million people, the tension in this country happened long before the President was elected, and we don’t want to be honest about it," Edwards said, "I know people want to point the finger at the President and say well he’s at the top, that’s where we get our leadership from. I’m running for Congress, I’m part of the leadership for this country. There are 535 people who are in Congress, they have an equal responsibility, not a subservient role, as the president to bring us together." Despite Edwards' confident defense of the president and his own self-assurance, he is undoubtedly facing a formidable opponent in Pappas, a Harvard-educated small business owner who was first elected as a state representative in 2002 when he was 22. Now 38, Pappas has run an aggressive campaign to keep the seat in Democratic hands. ABC News partner FiveThirtyEight currently gives the Democrat a 5 in 6 chance to win the seat on Tuesday. Earlier that Halloween day, the candidate toured a rubber manufacturing plant in the town of Rochester to highlight the importance of job training and technical skills, telling ABC News "I run every campaign like I’m five votes behind, and we’re just sprinting through the finish." When asked about the district's political indecision, Pappas said it's in New Hampshire's nature to look at candidates not solely through the prism of partisanship. "Most voters are Independents. They pick and choose based on the issues and the individuals and not based on party affiliation," Pappas said, "We’ve got an important case to make to the broad section of voters that are in the middle, who are Independents and who tend to focus late on political decisions like this." 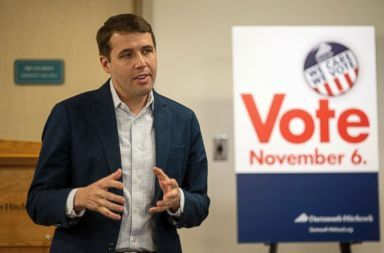 Democratic candidate for Congress Chris Papas meets with voters at the Dartmouth-Hitchcock Hospital in Manchester, New Hampshire, Oct. 30, 2018. Those independent voters include people like Kenny Couch, a 45-year-old veteran and production supervisor at the same manufacturing facility Pappas toured who told ABC News he is still undecided about who is voting for on Tuesday and lamented the current state of political discourse in the country. "I could care less about what Trump is doing," Couch said amid the whir of machinery around him, "Yeah there’s a lot of things I’d like for him not to do, but I don’t care about that. This is the issue I want to know about – why are our children going hungry? Why don’t we have these programs for our kids, statistics and where do we rank in the world in education – not even in the top 25. And we’re the greatest country in the planet." "For me personally the best candidate will at least attempt to do what he says he’s going to do and represent the constituents that voted him in and see where the chips lay," Couch added, glancing towards Pappas and offering a somewhat positive review, "I feel that he’s young, ambitious. I think that bringing industry to New Hampshire is awesome, bringing in the right people and things like that, so if he can do that and run on that, absolutely I think that he would be supported very well." Pappas has continued to hammer home an economy-centric message in the campaign's final days, telling ABC News "I think we’ve got to make sure that we have policies that can respond and ensure that we reward hard work and allow people to reach the middle class and stay there." On the question of whether or not he will support Nancy Pelosi as the next Speaker of the House if Democrats re-take the chamber on Tuesday, Pappas says he's taking a wait and see approach. "There’s going to be a leadership fight, we’ll see who runs and what the contours of that would look like," Pappas said. The Democrat said he can see himself working with the Trump administration on issues like infrastructure, but said there's no doubt that President Trump has contributed to the political strife not just in recent days, but throughout his time in the Oval Office. "The tone matters and our leaders help set that tone. And we’ve seen a very divisive couple years in this country in part because of the statements and policies of this President," Pappas said, "I think it’s important that we have checks and balances in Washington, that we look for ways to bring people together and create a conversation about the priorities of the voters and not get into the sort of name-calling and baseless attacks that people are just sick and tired of."